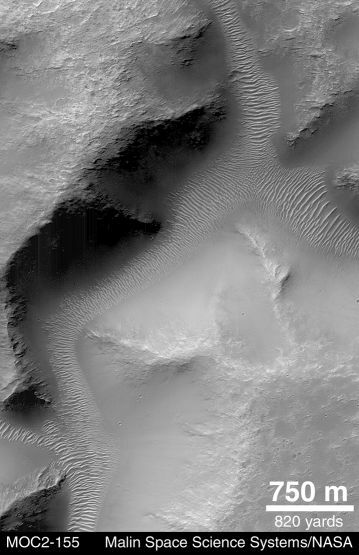 Opis: This tantalizing close-up detail of a network of martian valleys was recorded from orbit this April by Mars Global Surveyor's camera. Water may once have flowed here but now sand dunes stripe the windswept valley floor. The Mars Global Surveyor spacecraft arrived in orbit in September of 1997 and has been exploring the red planet since. Three other spacecraft, Mars Climate Orbiter, Mars Polar Lander, and Nozomi are presently en route.